If there is any one person responsible for the current stylistic form of crust driven black metal in Finland, Shatraug is as guilty a party as they come. He is either currently in, or been in almost 20 bands. The most notable/popular being Horna and Behexen, but his unholy seal of harsh melodies and acidic guitar tone is a defining factor that spins a malevolent strand throughout his entire body of work. Sargeist is yet another brooding labor of black metal art for the man that has produced 3 well received full-length albums and a wicked amount of split and EP releases that are difficult to keep up with. 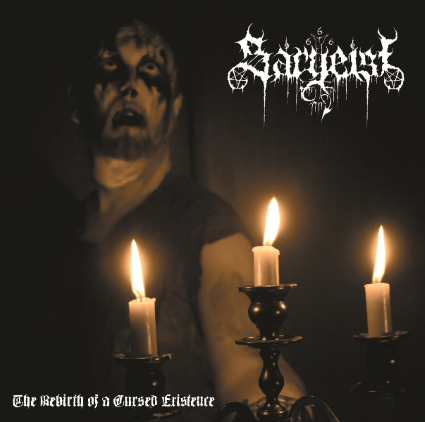 The Rebirth of a Cursed Existence isn’t a new album, rather a compilation release that compiles all of Sargeist’s vinyl only material on 1 72 minute CD so that the completists out there won’t wreck their mom’s credit in trying to obtain everything on ebay. To the uninitiated, Sargeist have a lo-fi sound and production at their back for a bleak misanthropic desire for lifelessness sonically, but Shatraug and crew use it effectively alongside a musical pulse that feels like frozen Celtic Frost riffs with that mid-paced tempo, and dissonant “melodies” that scrape the senses with harshness and despair. The heavy movement in the tempo and riffs at times reveals the punk spirit often found in the Finnish scene and it keeps the listener trained on the ancient hooks with head nodding abandon as on the plodding track “Sinister Glow of the Funeral Torches”. Hoath Torog’s (also in Behexen and Lords of the Left Hand) vocals are like ice glaciers scraping over razors as he further destroys any feelings of hope and life with his piercing cries for darkness. ~ by martyworm on August 7, 2013. Unforgiveably bland black metal. do people really still think this is something worth listening to? Geez. how many times do they have to keep trying to reinvent this stuff. lord all mighty jesus, they have sinned! someone get a snake! This entry was posted on August 7, 2013 at 6:45 pm and is filed under ALL REVIEWS, S-reviews.You can follow any responses to this entry through the RSS 2.0 feed.You can leave a response, or trackback from your own site.